A Reflections of a Rational Republican reader suggested that I attempt to debunk or challenge the notion from two posts (see “Rich Peoples Taxes Have Little to Do with Job Creation” and “The Myth of the Lower Marginal Tax Rates“) at the The Center for American Progress that suggest higher marginal tax rates are associated with more job creation and economic growth. Given the amount of data crunching involved and a number of other priorities, I have not yet had a chance to construct a detailed argument against the above claim, though I have several ideas about how to show that these periods of economic growth are likely earlier in the twentieth century when the United States was either at full productive capacity because of war, or it had less economic competition as economic competitors struggled to rebuild their economies. Furthermore, earlier in the century, the government spent a larger share of tax revenue on programs that were more conducive for economic growth such as defense and infrastructure spending vs. a budget today that has a far greater share of tax dollars allocated for entitlement programs and debt service. In other words, the Center for American Progress reports take the numbers out of their historical contexts and assume that correlation implies causation. Alas, I will save this argument for another day, once I gather the appropriate data to prove (or disprove) my hypotheses. However, the aim of this post is to share some results of my research that yielded nothing conclusive either way, but are nonetheless interesting. One of my early hypotheses about why high GDP and job growth are associated with periods of high marginal tax rates, is that governments would tend to lower tax rates during periods of low GDP and job growth. As such, one would expect lower marginal tax rates during these periods. In other words, the Center for American Progress report has the causal relationship backwards, and seems to imply that lower marginal tax rates led to low GDP and job growth, when it should be the other way around. To test this hypothesis, I plotted the marginal tax rate over the past 100 years against all the recessions over that period. 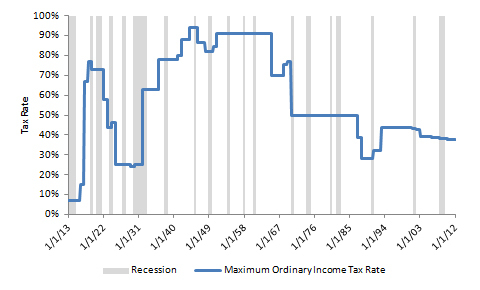 Unfortunately, at first glance I could not see any discernible pattern between recessions and tax rates. That said, there may be a relationship between recessions, tax rates, and the President’s party. For instance, a cursory look at the data may indicate that marginal tax rates rise during and after recessions in which a Democrat is the President, while they fall during and after recessions in which a Republican is President. For instance, they rose under Presidents Wilson, Roosevelt, and Clinton, and fell under Reagan and George W. Bush. That said, they fell under Kennedy and even Obama, and rose under George Bush, Sr., so the relationship is murky at best. Regardless, out of curiosity, I would like to solicit any thoughts about patterns readers might see in the data. This entry was posted in Business, Finance and Economics, Policy, Politics, Taxes and tagged Center for American Progress, Democrats, Recessions, Republicans, Tax Policy, Tax rates, Taxes. Bookmark the permalink. I don’t want to discourage further speculations or thoughts about patterns anyone may see in the data, but a friend of mine (“Tevyeh”) has discussed similar liberal arguments before, including in particular one of the very items you linked to, your first item from the Center for American Progress. In short, he would agree with you, that (as you said above) such arguments “assume that correlation implies causation.” He would say that there are too many variables floating around for us to draw any conclusions based on that kind of data. He’s probably right. I’ll still probably play around with the data this weekend out of sheer curiosity. Wow, I’ve been reposted, and I don’t even have a blog! Have fun playing around with the data, but I remain extremely skeptical about the prospects for extracting a convincing “signal” from it. It’s been so long that I don’t even know what it means. if we were to assume that changes in the top marginal rate are the only causal variable that significantly affect employment and economic growth. This assumption is, of course, absurd. Yep. That assumption by the Republican Party is, in fact, absurd. They should give up their militant, fanatic effort to avoid returning the top marginal rate to surplus-era levels. C’mon. That’s not what the Republican Party is saying. Tax policy is only one of many levers that government has that can help spur economic growth. All the Party is saying is that increasing taxes now would imperil economic growth. And they’d be right. Now where many of them are wrong is that the government needs to immediately cut spending. In the long run both taxes need to rise and spending needs to decline. However, until the economy recovers we need both low taxes and government spending on items that actually generate economic growth like infrastructure rather than entitlements. Taxes and the economy are tricky – there are lots of variables and not all of them are controllable, even if we had a single party state – so to think that either party is 100% correct on economic policy is just naive. Lower taxes on the lower socio-economic classes means they have more disposable income, which in turn gets spent. That money is collected by businesses in the form of food, rent payments, car payments, durable goods, etc. Lower taxes on the upper end of the socio-economic ladder means they have more disposable income, which they already have so this extra income goes unnoticed and either ends up in a savings or investment account with the other disposable income. Obviously this is over-simplified but I hope you get my point. The more inequality that exists within an economy the more true these statements become. I’m in the top 10% (just barely) and I wish my taxes were lower but the truth is a change like the Bush Tax Cuts expiring would cause me to pay more in taxes but it would not change my lifestyle. A recent college grad who makes $20k-$40k per year and is trying to raise a family could have a major lifestyle blow if their student loan interest rates double. I get sick of hearing people say “Make the rich pay their fair share” — it’s not about fairness – it’s about an economy that works and trying to make this planet a better home for our children and their children. How many people believe that our current economic system is working the way that it should? I’d guess probably less than 10%. The average income of the bottom 50% of our country (68+ Million People) make less than $16,000 per year. Over the past 30 years the Top 10% have taken 100% of INCOME GROWTH…the bottom 90% have had their incomes decline. Perusing the Wall Street Journal I saw an article about these huge skyscraper condos being built across the country…Penthouses that cost $100 MILLION DOLLARS, the DOW is above 13,000, and all the while rich white men are crying about how bad the economy is. Let’s not be fooled people. Remember, We the People are the government so if we don’t like what’s going on we have to actively work to achieve the society we wish to live in. If you are capable of work and in need of financial aid, then you should be working. If you are working in the US then you should be paid a liveable wage. I believe that the American Dream is for a single wage-earner to be able to provide their family, put their kids through school, and take a vacation now and then. All the Party is saying is that increasing taxes now would imperil economic growth. And they’d be right. But there is no empirical basis for that belief, according to your chart and to CAP. Now where many of them are wrong is that the government needs to immediately cut spending. In the long run both taxes need to rise and spending needs to decline. I’m philosophically inclined to agree with this statement, but I’m not sure the data bears it out. During the last surplus year, 2001, total Federal spending accounted for 18.2% of GDP. Spending on Social Security, Veterans Affairs, and Health and Human Services was 9.1% of GDP. Thanks primarily to the combination of Medicare Part D, baby boomers retiring, and injured soliders coming back from the wars, the % of GDP spent on SS, the VA, and HHS has crept steadily upwards since then. By 2008, it had reached 10% of the GDP. The recession obviously distorts these numbers somewhat, as the numerator (GDP) has stagnated while the denominator (spending) has gone up an average of 7% annually since the last surplus year, but based on current projections, spending on these three areas projects to stay between 11.6 and 12.1% of GDP through 2016. I haven’t chased everything down, so hopefully I’m missing something here. But I’m not sure that we’re going to be able to cut our way into balance. That’s why so many GOP plans– Ryan, Romney– talk about capping spending at a certain level, but never get into any detail as to what they’ll cut. They don’t want to talk about cutting VA funding. With regard to macroeconomic issues, the historical record usually leaves us groping in the dark. Failure to find empirical support for a macroeconomic hypothesis in a particular time series (GDP, employment rate, etc.) is no reason to reject that hypothesis. Reread my comment above. When a rigorous analysis of high-quality empirical data confidently points to a particular conclusion, we should (provisionally) accept it—theory be damned. However, it is often difficult or impossible to extract a meaningful signal from the available data—especially when you’re dealing with complicated processes (like those driving employment and GDP growth). In such circumstances, we should (in my opinion) default to those old standbys that wise people everywhere fall back on when they must make decisions despite insufficient information: reason and logic. There are many good theoretical arguments that make a convincing—or at least credible—case for an causal inverse relationship between marginal tax rates and economic growth (and employment). Just don’t ask me to produce empirical support for them from a chaotic hurricane of historical data. Agreed that we can’t draw any surefire “lessons from history” for human behavior in a system as complex as the US economy. In such circumstances, we should (in my opinion) default to those old standbys that wise people everywhere fall back on when they must make decisions despite insufficient information: reason and logic. Indeed. Reason, logic, and experience compel the conclusion that reverting the upper-level marginal rates to surplus-era levels will not be harmful to the economy. That is the point the CAP posts make (in response to universal, ferocious, unalterable, hyperbolic GOP opposition), and that the chart atop this post makes. That’s a pretty bold, confident assertion. I’m all ears if you can defend it. (I mean that sincerely; my policy views are constantly evolving and I’m wide open to theories that challenge my current positions.) In fairness, I didn’t defend my assertions about the quality of the models I referred to, but then again I never claimed that “reason, logic, and experience” compel their acceptance. By the way, the CAP articles attempt exactly what you agreed was a misguided approach: they present a “lesson from history.” Theirs is an entirely empirical argument, and a very poor one at that. Re: “…universal, ferocious, unalterable, hyperbolic GOP opposition”: You mean political rhetoric lacks logical rigor and is often downright fallacious? Say it ain’t so! I like your style, Tevyeh. Very rational. Thanks! My wife just thinks I’m a dork. @Tevyeh: Thanks for the exchange, sorry to be slow to respond. That’s a pretty bold, confident assertion. I’m all ears if you can defend it. Reasonable enough, and I owe you a better explanation. Summary will start like this: our rates are lower than they were in the booming economy of the 1990s; the problem with the current economy is an absence of demand, of the sort that a modest marginal hike on high income earners will not curtail; we have among the lowest taxes in the OECD (second lowest to Australia, I believe); the Bush fiscal policies added roughly zero in growth; folks who today insist that no tax anywhere ever be adjusted upward are the same folks who insisted that the Bush fiscal policies would pay for themselves and unleash a wave of growth, whereas folks who favor a return to some surplus-era levels have been not-wrong about everything over the past decade. Obviously, that’s just a starting point, and a hodgepodge. You mean political rhetoric lacks logical rigor and is often downright fallacious? Say it ain’t so! All too true; the unusual aspect is that rhetoric without logic or empirical basis accounts for 100% of GOP talking points and policy proposals. Hasn’t ever been thus, shall not ever been thus, but it’s where we are for the moment. Thanks for the response! Nerd that I am, I examined every point you made individually. International macroeconomic comparisons are extremely tricky, for a number of reasons. The present economic health of OECD nations spans a broad spectrum, as should be expected given the large number of variables that affect their economies. The macroeconomic impact of income tax rates—let alone marginal rates—cannot easily be isolated through international comparison. Nor do I think we should assume that our deviation from “typical” OECD tax rates is necessarily a bad idea. I’m reminded of a quip my mother used to intone about “cool kids” and bridges. Reread the last paragraph of the article you linked. While not endorsing the specifics of the Bush Administration’s tax policy, the author concludes that the 2001 and 2003 tax cuts should be extended (as they later were). I’m always skeptical about post-hoc estimation of a policy’s macroeconomic effects, as we lack a window into a parallel universe in which the policy was never implemented—in short, my point above about the difficulty of empirically isolating the effects of a single variable on a complicated system apply to the Bush tax cuts. As for those with unrealistic expectations about the stimulative effect of tax cuts, their errors are not an indictment of the underlying policies. Of course the political blowhards are going to say stupid things; intelligent people should disregard their rantings when trying to evaluate the merits of a proposal. A tax cut is not a magic bullet, but that’s no reason to reject it. …whereas folks who favor a return to some surplus-era levels have been not-wrong about everything over the past decade. Woah! Talk about bold assertions! You’ll have to forgive me if I don’t immediately concede the point. What’s your background? You are holding your own extremely well against reflectionsephemeral, and you only had to do 1% of the work I usually have to do to make a counterpoint. I’m impressed. Thanks! Right now I’m wrapping up a MS in Business Analytics at University of Cincinnati College of Business and getting ready for the level 1 CFA exam. In 2010 I got a JD from UC College of Law (not my wisest decision). Before that I majored in economics at SUNY Buffalo. Looking at your background, I was planning to ask you for some career pointers. I’m at the journey’s beginning, so to speak. Definitely. Feel free to shoot me an email. My email address should be on the “Media Kit” page. Well, sure, tax rates aren’t the only variable that influences the economy. But in this world that’s constantly changing, we have to choose from among a set of policies. No, looking forward, we can’t make the claim that this or that tax policy will lead to x or y result in the same way that we can say that the sun rose in the east this morning or that the Civil War was about slavery. But we can look at history and data and get an idea of what the likely impact of various policies will be. In the face of the uncertainty that defines human existence in this universe, we must choose what appears most likely to succeed. Given the experience of the US and of other comparable countries, it appears to be highly likely that returning top marginal income rates to surplus-era levels will not have a negative impact on the economy. You haven’t argued otherwise; you’ve argued that we can never really truly “know” anything. Which, hey, you and Socrates both, it’s a time-honored position. But the question before us in policy debates is: in the face of our long-term deficit problem and our current weak economy, should we return top marginal rates to surplus-era levels? There appears to be little evidence to support the view of John Boehner that “A tax hike would wreak havoc not only on our economy’s ability to create private-sector jobs, but also on our ability to tackle the national debt.” That view appears to be derived from dogma, not from observations of what has happened in the US and other developed countries. As to some of your other points… My point isn’t that the OECD is our lodestar and moral compass; it’s that their experiences are of some use in evaluating our situation, because they too are wealthy free market economies. And “those with unrealistic expectations about the stimulative effect of tax cuts” weren’t just the political blowhards– it was the supposed intelligentsia, like the Heritage Foundation, and the president of the United States, then the leader of the Republican Party. Surely there’s some accountability there. Actually, Tevyeh, it seems to me upon reflection that I gave too short shrift to your point about the contractionary effect of tax hikes. It seems to me that this is minimal, given arguments I’ve seen for example here. You misunderstand my position. I’m not making an epistemological argument. I’m arguing that your inference (that “reverting the upper-level marginal rates to surplus-era levels will not be harmful to the economy”) is not empirically supported—or falsified—by the statistics you cited (higher rates during the ’90s, higher rates in other OECD countries). I’m not asking for “proof,” but for some analytical rigor. …we can look at history and data and get an idea of what the likely impact of various policies will be. Thus, there is little evidence to support that the Bush tax cuts had a significant effect on growth. Sure, Dr. Thoma is technically correct to conclude that the data he cites provides “little” evidence that the Bush tax cuts had a significant stimulative effect. I’d go further by saying “no” evidence. I’d also say that it provides no evidence that the Bush tax cuts did *not* have a stimulative effect. Unfortunately, the next section in Dr. Thoma’s article begins with “So why didn’t the tax cuts have a stronger impact on growth?” Examining the article’s logic, it’s easy to see where he went wrong: absence of evidence is not evidence of absence. True. I haven’t laid out my own views on tax policy. But if I don’t get off the computer right now, my wife is going to kill me. Maybe another time! Having a JD doesn’t make me a lawyer, but I fear that I’ll forever bear the stigma anyway. When people ask me why I’m in my current academic program (analytics), I tell them that after three years of law school I wanted to use my brain for a change. I’m not entirely joking. Either way, you will come out of it all with a formidable education. Yeah, getting a JD/lawyering is about constructing plausible arguments. These days, I’m much more interested in constructing accurate arguments. Information that would have been useful yesterday ten years ago. the Center for American Progress reports take the numbers out of their historical contexts and assume that correlation implies causation. I don’t think that’s a fair reading of the CAP reports. In both of those links, they are arguing against conservatives, like the Club Of Growth, John Boehner, and others, who have argued that taxes are the alpha and the omega of economic growth. This first take at this data agrees with the CAP studies. We showed last week that lower rates are not associated with faster overall economic growth—just the opposite, in fact. And now we know that lower rates don’t coincide with higher job growth, either. So where is the evidence that the lower marginal tax rates spur job creation? It’s certainly not present in the past 60 years of American history. That fits with your post. Certainly, the surplus-era, pre-Bush Jr. marginal rates didn’t hamstring the economy. Conservatives, by your chart and CAP’s argument, are wrong to universally fight to preserve or lower all rates forever. Huh, misspelled my name that last post. Oh well. I obviously don’t think lower taxes are the alpha and omega of growth, but they certainly help. The first Bankster Bubble since 1929 happened in 2007…any coincidence?